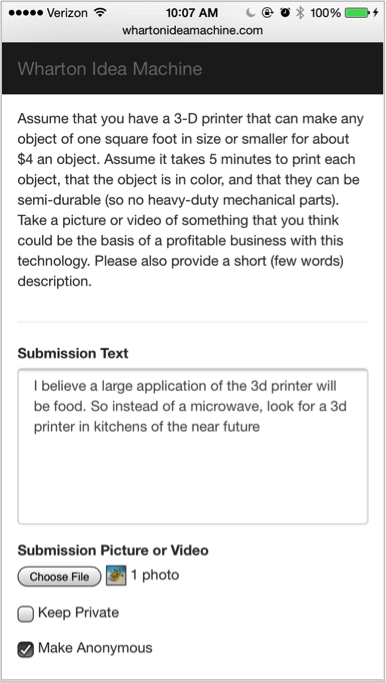 IdeaMachine prompts activity outside the classroom by texting and emailing students a question or challenge that relates to a particular subject matter they are exploring in class. From their smartphone, tablet or PC, students can submit a text, photo or video response. Though IdeaMachine can be used for a number of purposes, it was originally designed for helping students practice idea generation techniques, and allow the instructor to use the work of students to illustrate important idea generation concepts. Following are some example Challenges used in a Wharton Entrepreneurship Class for generating ideas for new products and services. In this use, the challenges help students to examine trends and look for new innovations. Take a picture or video of something that represents a trend or product category that is relatively unpopular or rare now, but which you think will become more popular in the future. Please also provide a short (few words) description. Assume that you have a 3-D printer that can make any object of one square foot in size or smaller for about $4 an object. Assume it takes 5 minutes to print each object, that the object is in color, and that they can be semi-durable (so no heavy-duty mechanical parts). Take a picture or video of something that you think could be the basis of a profitable business with this technology. Please also provide a short (few words) description. Assuming unlimited resources, how would you address this issue?